Undercover feels that for the person that wants to enjoy nature, they should have at their disposal all of the necessary gear to allow them to get the most out of their experience. 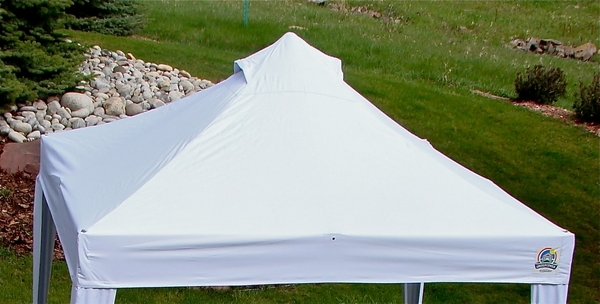 With the Super Lightweight Commercial Aluminum Popup Shade Canopy Package with White Top, you have a covering that can be set up by one person in a matter of seconds, providing you with a large amount of cover from the sun's rays so that you can get the most out of your time outdoors. * Please Note: Flame Certification: This item meets both CPAI-84 and NFPA-701 Flame Certification. The top features only a CPAI-84 tag. The manufacturer'sFlame Certification s can be downloaded from this page. Wheel bag: 63" x 12" x 12"
Can lettering and logos be printed onto this tent? 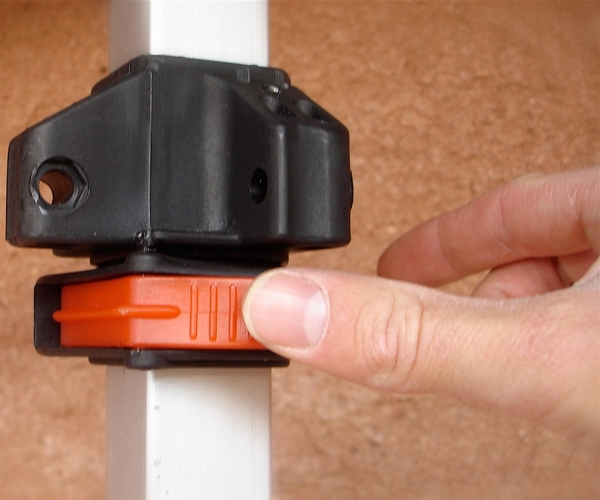 There are stabilizer bars that can be used on an EZ up tent. Would these same stabilizer bars work on the Undercover tent as well? I would not be able to ensure that the EZ Up stabilizer bars would also work on the Undercover line of canopies due to slight size variations between manufacturers. We have found that while many units are sold as a 10' x 10' size, the actual footprint can vary several inches from manufacturer to manufacturer. I don't know... I have never used an EZ Up, only Caravan and Undercover, mostly because they are light weight. Using the Undercover with the weight tubes I survived one very nasty thunderstorm without damaging my tent or merchandise. I believe the stabilizer bars for ez up canopies will work with this model. This item weighs 32 pounds when in the included roller bag. What sides, if any, will fit this tent? 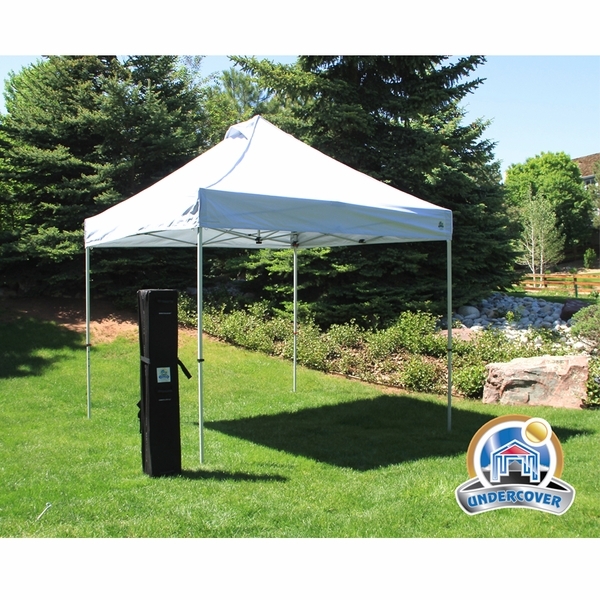 Undercover's standard sidewall package is best used with this tent. The item is the Undercover 10 Foot Zippered Poly Sidewall - Set of Four. Do you have a canopy top that's either a 500 or 600 denier? I need a top that can resist tearing and isn't easily damaged. Yes, please see the Undercover 10 x 10 Professional-Grade Aluminum Popup Shade Package with White Top, which features a better frame and a 600-denier polyester top. 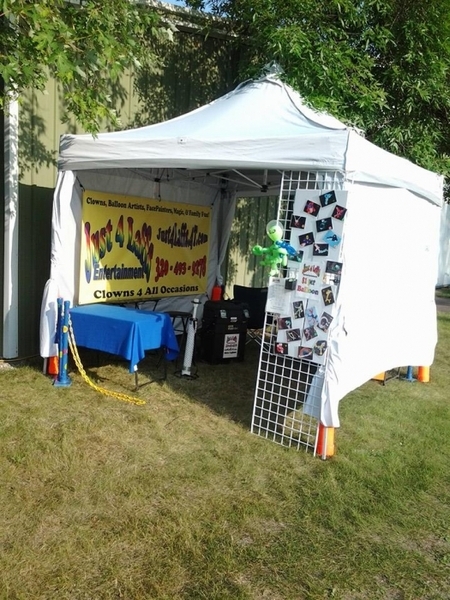 We also recommend the Craft Show 10x10 Canopy Package Deal + 4 Sidewalls & Weight Bags, which features the Caravan DisplayShade model (our bestseller), which can be purchased with a 600-denier white top or a 500-denier colored top. Does this canopy have corner straps or loops for tie down ropes? No, they do not. They come with spikes that go through the feet. Does this model have the heat reflective silver coating? No, it does not. However, it comes with 99% UV block fabric which provides excellent sun protection. How do you secure this canopy into grass or sand? Does it come with anchor pegs? It will come with stakes for securing into grass or sand. Can this be set up on concrete to use at an outdoor craft show? Yes, but you must weigh it down with either Weight Bags or Gravity Tubes. I really wanted an aluminum light weight well built popup because I hurt my back and couldn't handle the heavier popups.This popup does this exactly. the legs are longer than usual but it seams that is what they had to do to keep the aluminum legs strong enough. Every time I get this canopy out my back is very happy and the parts are very well made! ConsLong legs but this was not a problem for me. I have only had this canopy one month, but I am impressed with the light weight, the quality finish and details like the releases for the legs, the venting on the canopy and the ability to tighten the canopy over time with a dial under the peak. I was looking for something I could easily carry and load into our RV and this fits the bill. You will definitely need to stake or weight this canopy...Super light weight. My husband and I absolutely love it! I recently purchased the 10 x 10 super lightweight commercial aluminum popup canopy. My husband and I absolutely love it! I think it is worth every penny, is very light weight (I can move it and take it down myself), looks really great, and easy to store. I highly recommend this canopy over anything I have seen my neighbors or family purchase in the past. The tent is easy to set up and to store. The carrying bag is very well designed to hold the tent with the cover intact and has pockets for the signs we use for our booth and other booth supplies. I like being able to use the storage bag to be able to keep the cover clean and safe from damage. 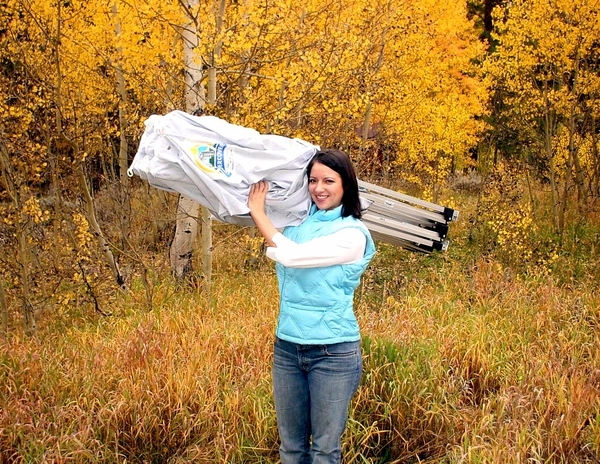 The tent is lightweight and easy to carry. I would recommend this tent to others. ProsLightweight, easy to set up. Well designed storage bag. Extremely light. One woman job. Easy to set up and break down. You don't even break a sweat. Folded it is about a foot longer than my old one which keeps it from fitting inside one of my vehicles so I am limited to transporting it in the bed of a pickup. It is 63 inches in the bag, my previous unit of a different brand is 52 inches. Keep this in mind for your situation. If this is not a problem for you it is a winner. ConsThe storage transport bag is about a foot longer than some others. Very impressed with ease of putting this canopy up. Heavier fabric, very well made. The new canopy was easy to set up and take down. My shipment arrived quickly and in good condition. After all my retail shopping for canopies comparing features and prices, the order process was easy with this store. ProsThe canopy has several height adjustments that are easy to operate. The center dial feature helps to keep the fabric taut as the canopy ages. Offers some UV and light rain/mist protection. Good price point compared to other online retailers. Comes with a wheeled carry bag. ConsCan't leave up, even when weighted down, in any wind above 10 mph; with thicker heavier legs on the frame I believe it would be possible to leave up a little longer. If it could remain up and in place with up to 20 mph wind and been fully waterproof, then I would have given it 5 stars. A quick look at the simple instruction and I was able to set up the tent with no problem. We'll designed. The no-pinch release on the frame is wonderful. The tent is nicely constructed. We used our canopy for a 2 day craft show and we LOVED IT!!!!! Setting it up with 2 people is so easy. We watched the video and set it up at home a couple of times before we took it on the road. When we got to the craft show, it only took approx. 3 minutes so put it up. Very professional looking! Highly recommend this canopy to anyone that does outdoor craft shows. Putting some weight on the legs is a good idea if there is wind. Taking it down was as easy as putting it up! Also love the carrying case. Very easy getting it back in. Great product!!!! ProsLight weight, looks great, easy set up and tear down, love the carrying case. ConsOther than needing to put extra weight on the legs in windy conditions, this canopy is wonderful! 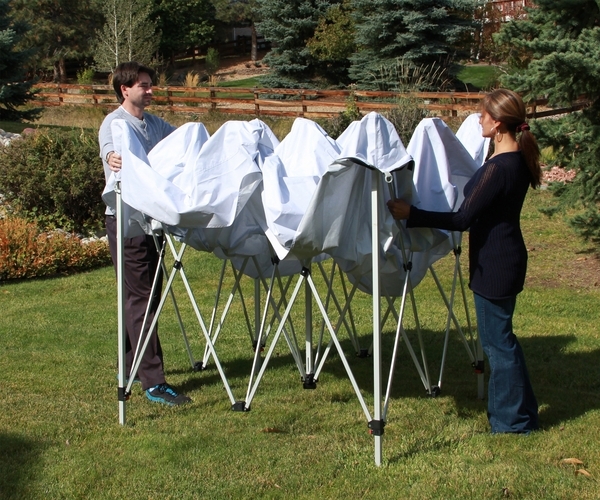 I ordered the canopy as a shade tent during a video shoot that took place in the desert near Tucson, AZ. The canopy worked great and helped protect us from the 100+ heat and a couple of heavy rains that rolled in. I was able to set up and take it down by myself. The Carrying case is great with appropriately placed carrying handles and roller wheels. The case also comes with a set of backpack straps that I haven't tried yet. Proseasy set up and a great carrying case. Once you get the hang of putting up the canopy by yourself it is fairly easy. I would agree with others that the instructions are not much help. ConsCould have a little sturdier build. Was tempted by the concept of one-person operation. The canopy indeed can be erected and dismantled by one person, and the hardware is first class. Easy up, easy down, and very effective at providing shade and shelter. ConsThe directions show erecting and disassembling the unit, but don't tell you that for first use you have to attach the canopy to the frame, for which there are no directions. After you have done this, it folds, stores, and erects as a unit. I had a canopy . . . not built for what I was using. Then a friend referred me to this store where he had recently purchased a commercial canopy for vendor events for his hobby. I went ahead and ordered a 10' x 10' Super Lightweight package and WOW. I can put this canopy up and take it down ALL MYSELF. Being a female I generally get offers of help when setting up for an event but not as often when I am tearing down. It was a pleasure how easy this was to do by myself. I wish I hadn't put it off and fought with my other one for so many years. This was the best purchase I have ever made!!!! ProsEase in setting up and tearing down ALONE Sturdy construction. LOVE the carry case . . . easy to use and a variety of ways to carry. Fabric keeps things much cooler. ConsHaven't found anything I dislike . . . was surprised how tall it was packed up but still fits in my vehicle so it doesn't really matter. BUT if you have space issues make sure you check because all 10' x 10's are not the same length when folded up. I've set up this canopy twice with very little help and it was pretty easy. ProsOnce I set it up, it was noticeably cooler under the tent than outside of it. It was pretty easy to set up with very little help. It fits easily back into the carrying/rolling bag. ConsThe instructions in the canopy package weren't as detailed as I needed so I went on-line and got the step-by-step instructions. Because I was setting it up by myself, it got a little "tippy" during the set up. Received item promptly and found it to be just as described. Item is durable and easy to set up and take down. Purchased it for a group of older people who will use it at various events in the coming year. They were very pleased with items durability and quality. ProsEasy to transport, lightweight frame, no-pinch levers to raise legs of canopy, velcro strips which make it possible to attach "sides" to the canopy for rain protection. I am using the canopy for the farmer's market. It is very easy to set up and take down on my own. I can set up the canopy, table, and banner in 12 minutes! The carrying case is great - easy to roll to my site and load into the pickup. Just put up the canopy in the backyard a few minutes ago. Had to come inside and review the two videos. 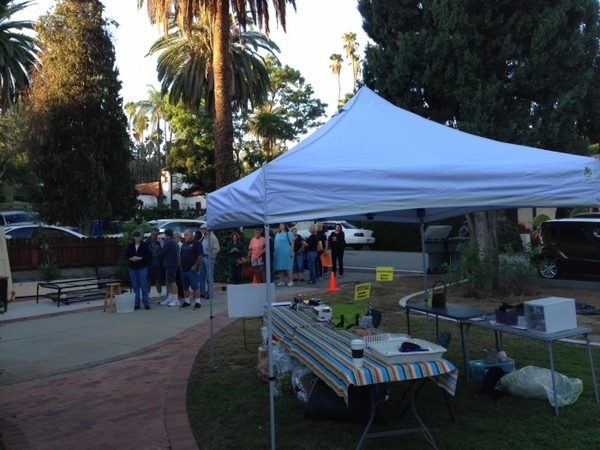 Once we got the canopy set up, we were impressed. Seems sturdy and made with quality materials. We will take it out next weekend for a camping trip. ProsEasy to set up, once you figure it out. Looks very nice and provides a lot of shelter. ConsThe items is fine - written directions could be more detailed. Watch the two online videos, and you'll figure it out. My first ever product review! I am so impressed with the UC-3 10X10 I hope I can help folks avoid the mistakes I've made in the last 15 or so years! Have used it at Road Atlanta for 2 years now. High winds, an occasional monsoon are to be expected. The UC-3 couldn't care less. Spike it on turf; use concrete filled 4" PVC on paving. Solid as a rock as some neighbor's canopies collapse or take to the air. Am sure my use voids any & all warranties. So what! It's light weight, easy up & down & actually fits easily back into it's carrying case. Even at age 69 I plan to use it for years! We just bought 6 for our school and they are great. Easy to put up and take down. The quality is excellent. Everyone was commenting on how nice they are and asking where we got them. White color is great and the price was right too.